A former University of Brighton fashion student has raised over £75,000 to appeal against a fine for breaking electoral law during the EU referendum. Darren Grimes says that he needs the crowdfunding cash to battle it out with the Electoral Commission, which has instructed Fieldfisher and top QC Sir James Eadie. Grimes, now 25, ran a pro-Brexit social media campaign aimed at young voters during the 2016 vote. But he found himself in hot water after spending hundreds of thousands of pounds in breach of spending limits and without declaring it properly, and hit with a personal £20,000 fine. The Electoral Commission also referred Grimes to the police to investigate possible criminal offences. In a video posted on Twitter yesterday, Grimes accused the regulator of “spending vast sums on City solicitors and the government’s own QC” in defence of its ruling. The Electoral Commission confirmed to Legal Cheek that it has engaged international outfit Fieldfisher and Eadie of Blackstone Chambers, saying that “we are obliged to ensure we have representation that can defend the decision-making process that we undertook”. It denied Grimes’s claim that the Government Legal Department is picking up the tab. In his pitch for funding, Grimes complains that “the Commission will have the top QC in the land, will have the top solicitors in the land, and all paid for by you [the taxpayer]”. 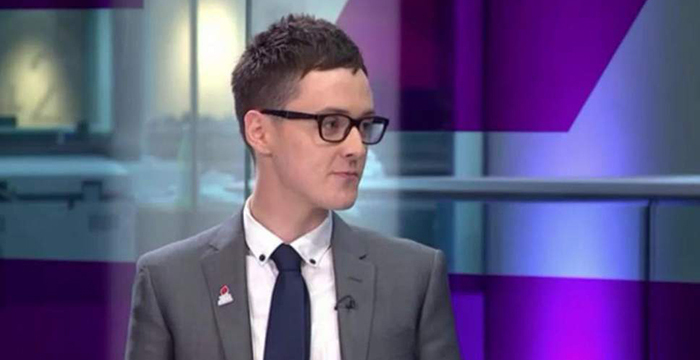 The ex-fashion and business student now works for the right-wing Institute of Economic Affairs think tank. Grimes was found guilty of two breaches of the Political Parties, Elections and Referendums Act 2000 and fined £20,000. A crowdfunding campaign to fund an appeal has raised nearly £77,000 to date. The appeal, in the London County Court, is currently scheduled for July 2019. In a separate High Court case, the Electoral Commission was found to have misunderstood the electoral rules when it initially cleared Grimes and Vote Leave. That litigation was also powered by crowdfunding, with the Good Law Project paying £70,000 to Jessica Simor QC for her work on the case. The Good Law Project confirmed on Tuesday that this case is also set for an appeal hearing in July. Shame he hasn’t gone to prison really. Remoaner extremist wants to lock up all those who disagree with him, methinks. All Brexiteers should be locked up until they vote to correct their mistake! I doubt you ‘think’ a great deal. I don’t know what Mr Grimes and I disagree on other than clearly disagreeing on whether electoral rules should be enforced or not. A top fashion student is fighting a top QC after a top judge made a top judgment after top intercession by a top Electoral Commission. Given all of this, why is Jessica Simor not described as a top QC? Does this have to do with sexism, or just lazy writing? Neither – its to do with the context of the article, which describes a David v Goliath type scenario. If Simor had been instructed by the Electoral Commission then she would have been described as a ‘top QC’ in the article. Not everything is to do with sexism. I didn’t think it did have to do with sexism. I was making a spurious and incoherent point about the lazy ‘journalistic’ use of the word ‘top’. Fair enough, I think the author was just trying to show Grimes to be up against a well-resourced opponent, use of the word ‘top’ was part of that. It’s a lazy word, devoid of any real meaning, especially in the context of a QC. I’d argue there are top QCs and ones that are not as good as the top ones. But the word ‘top’ doesn’t mean ‘good’. Don’t let Kronos hear that. Why hasn’t LC done a story on Barrister Hendron’s new website and sailing blog? If you want a real laugh check out his fund raising page for his round the world tour. The round the world tour at present looks like he’s taken a boat out a few hundred yards or so until the weather gets a bit choppy, then heads home for a quick snifter. He’s bringing his vast legal expertise to a lighthouse near you!!! Man who didn’t properly research laws now begs for others to pay to clear up the mess he created. Interested to see what his grounds for appeal are. No sympathy whatsoever, even disregarding his political views. He comes across as an obnoxious publicity-seeker crying because ‘the system’ has come down hard on him – why shouldn’t it if someone breaks the law? You just went full Elon, never go full Elon. Allowed himself to be taken advantage of by older people far more devious and cunning than he. Life lesson for you. He seems to me a pretty hateful individual and I look forward to the result of his case. I know this guy. Classic attention-seeking twerp. He used to be a Lib Dem but left after he kept bringing up, and losing arguments about, Europe – his reaction to considered and rational debate was to resort to abuse and as hominem comments. When people complained he screamed censorship and tried to play the victim. Now he is at home among his own political kind, it’s obvious he hasn’t changed. lol, we didn’t make this mess you twerp. Own it. Watched the Twitter video for a bit until I realised he is a weak impression of Richard Littlejohn. The absolute state of that shirt, tie, and suit. What are the odds on him wearing brown shoes too? Haha. Funny comments, hat tip gents.